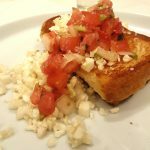 You will love this no-fail, no-egg recipe that I have had since I was an adolescent growing up in a small town in south-central Mississippi. There, Quinn’s, the local pharmacy, was virtually the only place to purchase cosmetics. 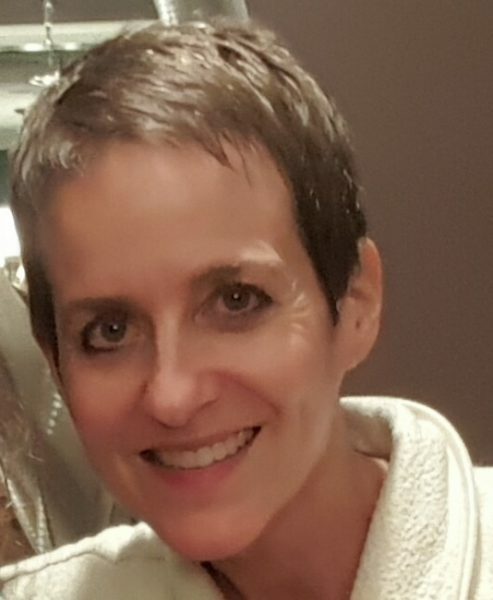 Just beginning to experiment with make-up, one year, I was seduced around the holidays by “gingerbread” flavored lip gloss which was sold complete with a gingerbread cookie recipe printed on an accompanying card. I first made them for one of the attorneys with whom my mother worked. 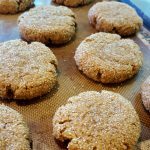 He loved them and, thereafter they became known as “John’s Gingerbread Cookies.” I made them frequently but I haven’t made them for a long time. However, this holiday season I saw a mason jar filled with miniature gingerbread boy and girl cookies and tied with a bow. I was smitten, yet I never had an opportunity to make them during the winter holiday season. 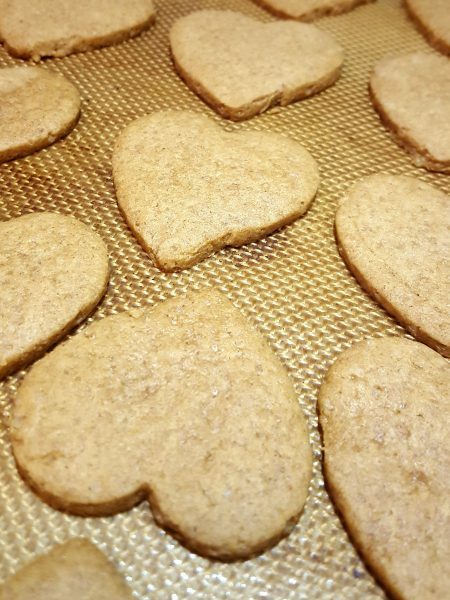 But, with my partner Bob struggling with several weeks of pain from bulging disks in his neck, I decided he needed a treat so I made a half batch shaped as hearts. He ate half of them in half a day. 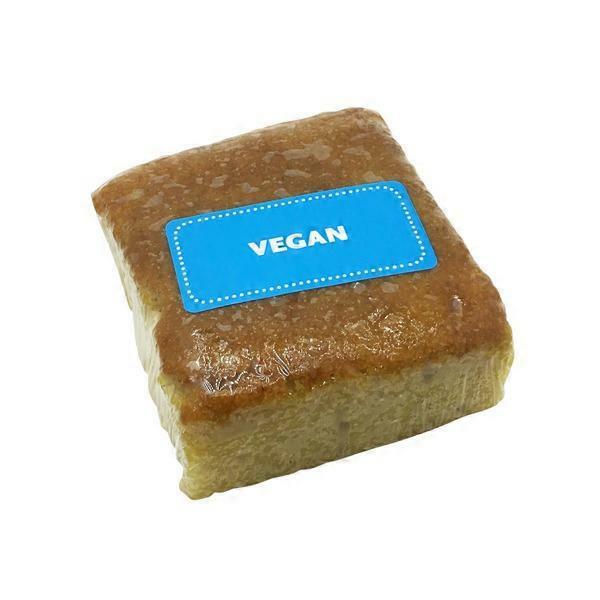 The only ingredient that needed to be substituted to make the cookies vegan was butter. Thank goodness for Earth Balance. The rest is a piece of cake, er, bite of cookie. And your home will smell divine. Preheat oven to 350 degrees. Line two baking sheets with parchment paper or, my favorite, Silpat (silicone baking mats). In large bowl of electric mixer, cream together vegan butter and sugar at medium-high speed until fluffy. Beat in maple syrup, ginger, cinnamon, and cloves until completely combined. Don’t worry if mixture looks slightly curdled. Then, with mixer on low, beat in flour, 1/2 cup at a time, just until incorporated and dough comes together. Add water, a teaspoon at a time, if dough seems too dry. Avoid over-mixing or cookies will be tough. Working with one-fourth of dough at a time, roll it out on a lightly floured board to a thickness somewhere between 1/8 and 1/4″. 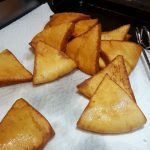 Cut into desired shapes, place close together on prepared baking sheet, and bake 10 to 12 minutes or until lightly golden brown. Cool slightly and then remove to a wire rack to cool completely. Repeat with remaining dough. I can’t see Santa’s Forest for these adorable trees. 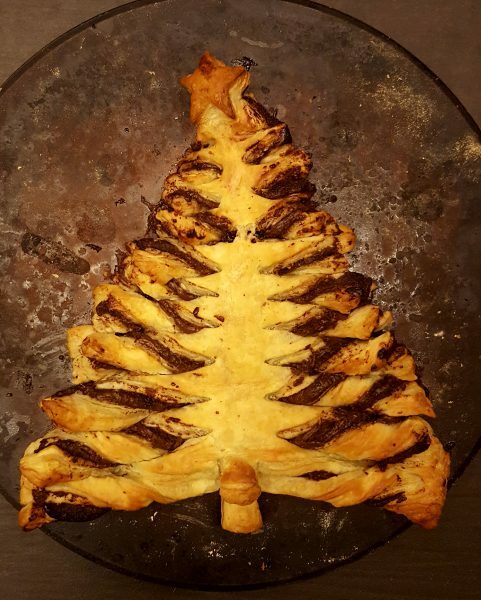 Apparently they are all the rage this year, but I was evidently a little late to the pastry tree party. 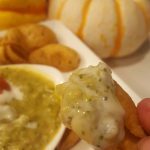 Make yours with pizza dough or puff pastry and spread with the sweet or savory filling you most crave. Just be sure to include a creamy base to adhere the layers together. My version is sweet–but not too–uses only three ingredients and, after the pastry thaws, is ready to devour in under 30 minutes. I left a Middle Eastern dinner and this tree last night for our dog sitters (yes, we are those dog owners) while we joined friends for their Christmas Eve Eve tradition: a salad and sip of wine followed by a Christmas light-lit walk over to the Naro, an independent film house, to see “It’s a Wonderful Life.” The twins left some of the tabouli salad but not a crumb of the pastry. It was a huge hit with these 19 year olds. 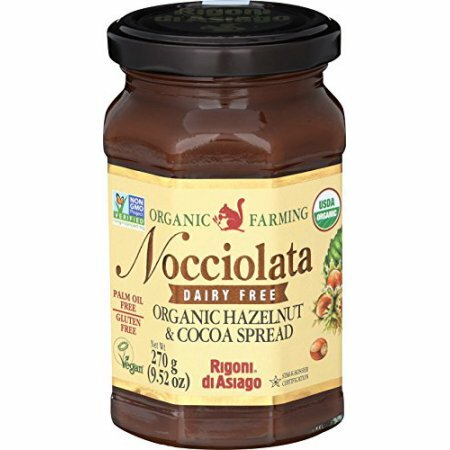 My take on this new classic was inspired by its key ingredient: Rigoni di Asiago’s Nocciolata Oraganic Dairy-Free Hazelnut & Cocoa Spread, generously sent to me for product review purposes. 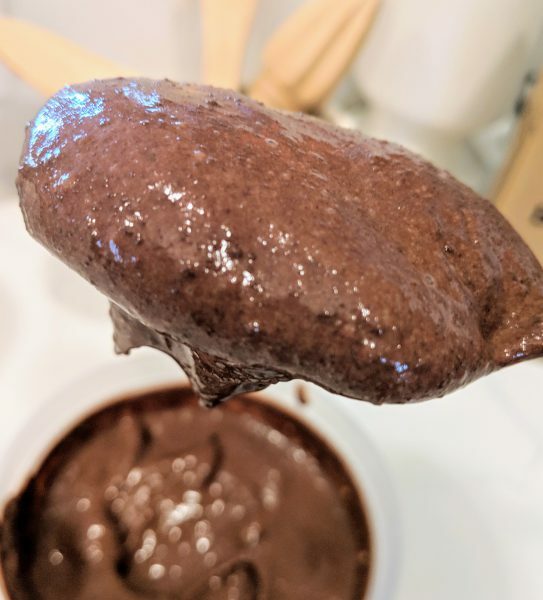 With a deeply nutty and chocolatey flavor–its richness undiluted by dairy–and a thick and creamy–but spreadable–texture, this product is tops in my pantry (it needs no refrigeration). It is also gluten- and palm oil-free. Preheat oven to 400 degrees. On baking stone or parchment- or Silpat-lined baking sheet, stack the two pastry sheets. With a sharp knife, cut into a triangular tree shape with a 1-inch or so wide trunk at the bottom. Remove top sheet, spread bottom sheet with hazelnut-cocoa spread, replace top sheet, lining up edges, and press down gently. Cut 1 star from scraps and whatever other shapes you like fir nibbling or to serve as croutons on salads. Place pastry shapes on a separate stone or lined baking sheet. Make 3/4-inch wide horizontal cuts from outer edges of triangle toward the center, stopping even with outer edges of trunk leaving a 1-inch or so wide trunk up the center. Twist each long cut strip twice and the shorter ones once, pressing tips firmly against baking stone or sheet. Brush very lightly with non-dairy milk, press star onto top point, and brush star with a tiny bit more non-dairy milk. Bake for 20 minutes or until golden brown, but remove shapes cut from scraps after 10 or 15 minutes or they will burn. 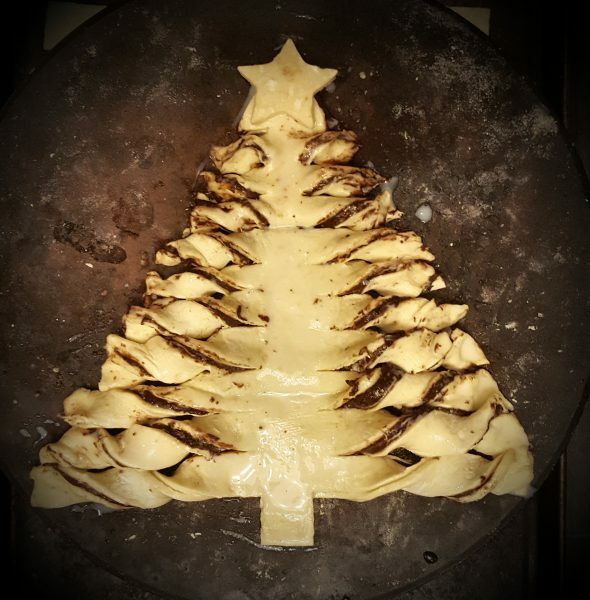 Remove baking sheet with pastry tree from oven, cool slightly, and slide tree onto serving platter. Serve warm or room temperature. 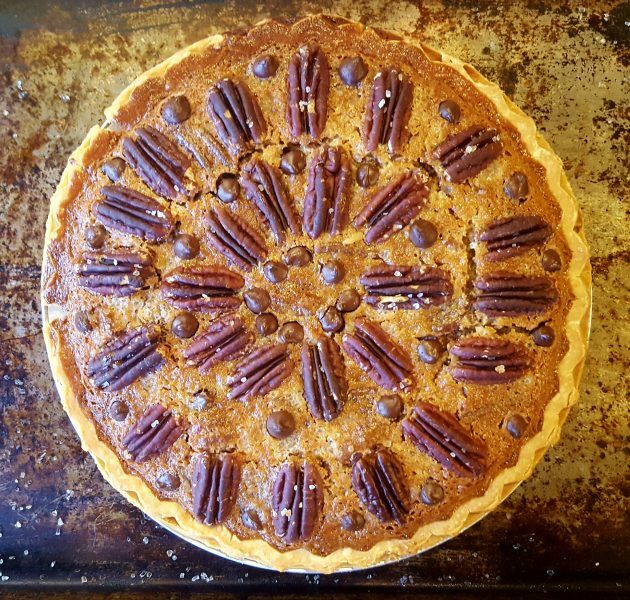 If a traditional pecan pie–with even more pecans–is what you crave, this pie is perfection and as easy as, well, you know. Most recipes call for 2 cups–or even just 1 1/2 cups–pecans. Why? Mine calls for 3 for the best filling-nut ratio. This is no time to skimp. A week ago, I published my other favorite pecan pie, though that one has a more custardy texture, as it is made from a tofu and cornstarch-based custard. Bob the omni liked that one but he much prefers this one, which he eats with his chocolate ice cream that is always in the freezer. He did admit that another flavor of ice cream would be optimal. So serve either pie with vegan vanilla ice cream and/or vegan whipped cream–perhaps a little drizzle of brandy or bourbon–enjoy, and then let us know what you you think. Happy Holidays! Note: If you eschew booze, just replace it with 3 tablespoon water and 1 tablespoon of fresh lemon juice, as Veganegg has a somewhat pronounced, slightly savory, flavor that needs countered with the assertive flavor of alcohol or with an acid. Set out pie crust if frozen. Preheat oven to 350 degrees. Spread pecans in a single layer on a baking sheet, spray with nonstick spray, sprinkle with 1/2 teaspoon sea salt, and toast for 3 minutes. Remove from oven and set aside to cool. In a large bowl, whisk together Veganegg with water and brandy or bourbon. Whisk in all remaining ingredients. Set aside 32 pecan halves and spread all the rest into pie crust. Sprikle with sea salt remaining on baking sheet. Place pie pan on baking sheet, pour filling evenly over the top. Decorate the top with concentric rings of pecan halves and bake for one hour. Pie will seem quite “loose” but will firm up as it cools. Because of this, you may need to gently reposition some of your decorative pecan halves. Cool completely, cover, and chill for a couple of hours. Serve topped as desired. 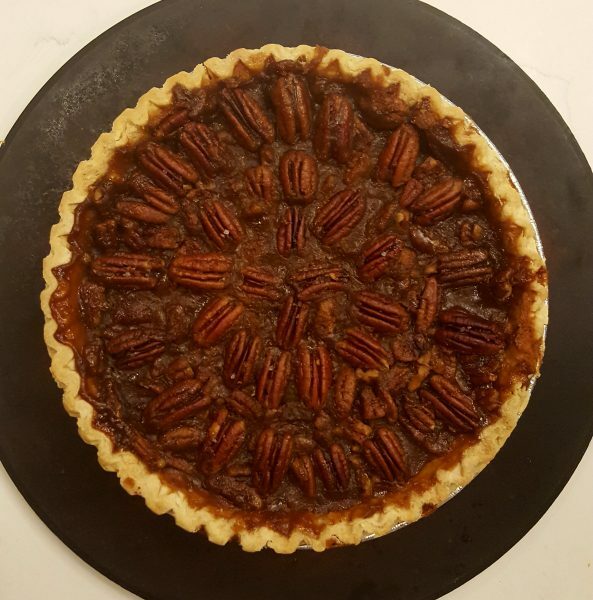 I got inspired AFTER Thanksgiving to experiment with pecan pie. The one at our repast was not vegan, so I couldn’t partake. On a recent trip to Duck, NC, Bob had a scrumptious pecan tart with bourbon ice cream and salted caramel sauce which I had to taste for research purposes. I felt the caramel sauce was overkill. And I knew I wasn’t going to make ice cream just due to time, so I added the booze to the pie and served the slices with purchased vegan vanilla ice cream. Yes, please. The question for vegan pecan pie bakers is silken tofu or no? I say yes, as I was never a fan of syrupy pecan pie. So, I like the slightly more custardy texture of this one, which slices beautifully. I hope you do too. 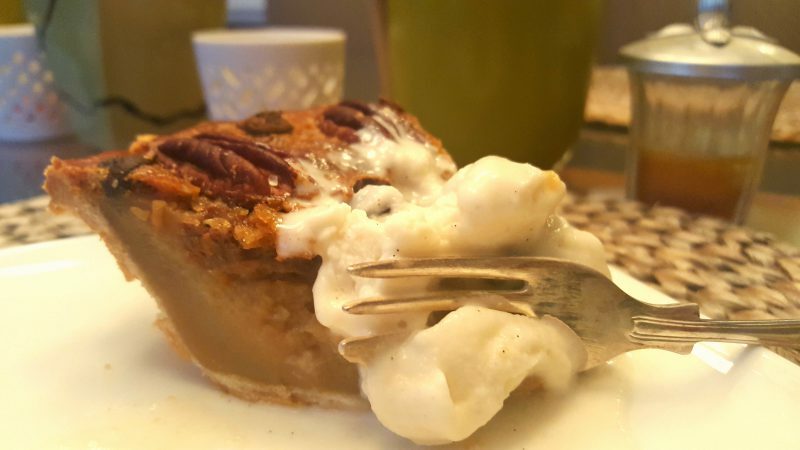 As I mentioned, this pie is addicting served with softened vegan vanilla ice cream. And while I deemed the caramel sauce too much of a good thing, everyone will look the other way if you drizzle a hint more brandy or bourbon over the top. Heat oven to 350 degrees. If pie crust is frozen, remove from freezer. Spray a baking sheet with non-stick spray, spread pecans in a single layer on sheet, sprinkle very lightly with sea salt, and roast in oven for 3 minutes. Set aside, but leave oven on. In a medium saucepan, combine the vegan butter, sugar, corn syrup, molasses, corn starch, flour, and sea salt. Stir and cook over medium heat until mixture comes to a boil. Reduce to a simmer and cook, stirring, for another minute. Remove from heat and stir in brandy or bourbon, vanilla, and almond extract. In a food processor, process the silken tofu until smooth. Add the maple syrup mixture and pulse again well combined. Reserve 28 of the pecan halves, add half of the remaining pecan halves, and break up the temaining ones as you add. Use a spatula to gently swirl them into the filling. Transfer filling to pie shell. 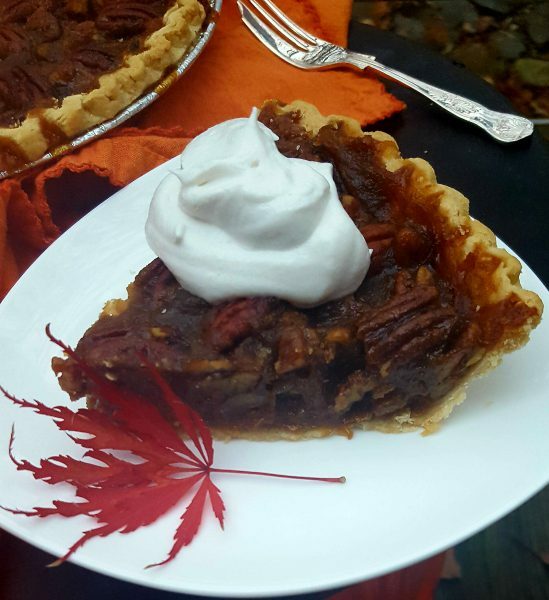 Arrange the reserved pecans on top of the pie in two concentric circles. Dot with chocolate chips if desired. Place pie on a baking sheet on the middle rack of your oven and bake for about one hour, until the crust is nicely browned and the edges of the pie are set. The center might still be a very slightly jiggly. 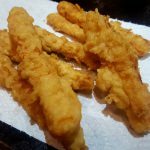 Remove from oven, sprinkle with just a hint of flaky sea salt like Maldon or just a nice coarse variety and allow to cool completely before serving. 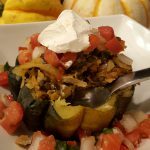 Serve with softened vegan vanilla ice cream (I like So Delicious No Sugar Added) or vegan whipped cream. 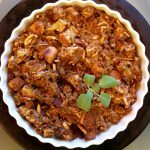 Happily tasked with contributing several items to this year’s Thanksgiving repast, I thought I might reduce my cooking time–though I love to cook almost as much as anyone–by purchasing prepared cornbread for the stuffing. I applaud virtually everything about Whole Foods, so I thought I couldn’t go wrong. But, I was wrong. Bad wrong. As Bob opened each cellophane wrapped hunk, I thought the moist crusts looked very similar to poundcake. I tasted it and, as best I could tell, it was poundcake–and a very moist one at that–made with cornmeal. Who would want a bread that sweet with their chili, lentil soup, or any of the rest of the WF family of soups next to which this alleged “cornbread” is sold? I don’t even care for cake that sweet. But, I like savory and sweet combos as much as the next gal, so I soldiered on. Still, this cornbread was so sweet that I was dubious about how compatible the celery, onion, and sage was going to be with these cakey crumbs. Yet, I didn’t have time to stop and make cornbread from scratch, so Bob persisted, crumbling the cornbread and one baguette into a huge bowl. And I proceeded with my recipe, adding the aforementioned plus lots of beautifully toasted pecan halves. 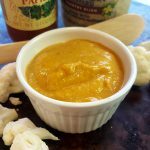 As I poured the vegetable stock over the mound of ingredients, I watched in horror as it dissolved into what can only be described as a cookie-dough like consistency. Desperate, I added the half cup or so of Panko bread crumbs that I had on hand, but it was of no use. I decided to go ahead and bake it, hoping that science and physics might work some kind of magic in the oven. But, alas, I pulled it out, tasted it, and my response can only be described as disgust at what was a dense, heavy, pasty, unpleasant-tasting mass. I marched straight out the front door, across the little Japanese bridge over our dry river bed, and into the woods where I unceremoniously dumped the whole lot of it into the deep carpet of leaves. We live on Buchanan Creek which feeds the Chesapeake Bay and I know from my freelance writing about eco-issues that residents are not supposed to dump fatty ingredients down the sink or onto the ground. However, I wanted that glob out of our house–I didn’t even want it in a sealed bag in the garage–and fast. There would be no stuffing this year, but there was more than enough delicious food. And I didn’t tarnish my reputation as one of the family’s inspired cooks. I hope your Thanksgiving was earmarked by culinary successes or, at the very least, culinary lessons learned well. Happy Holidays! I hope my sweet, stubborn, late paternal grandmother, Mam-ma, is not “rolling over” at what I’ve done to one of her four iconic Christmas cookie recipes, mailed to us wherever we might be if not with her and Pap-pa, packaged in waxed-paper lined tins with the faint aroma of mothballs. It is hard to improve on perfection and her roll and slice cookies were indeed perfect. So, my version is not better, just different. 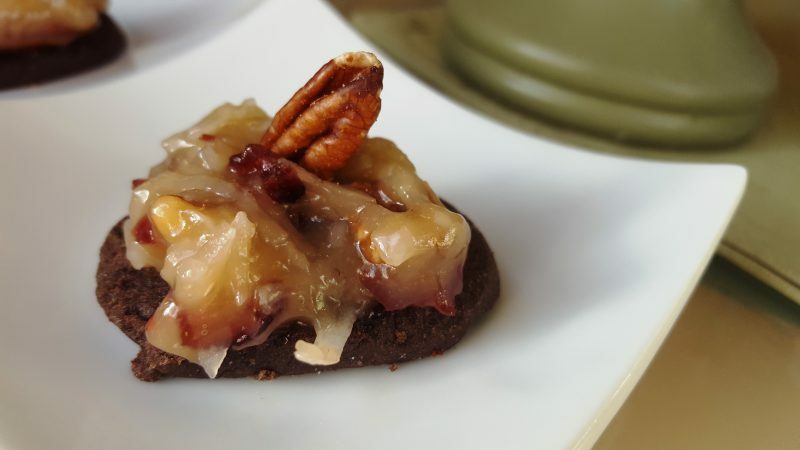 If you want to make Mam-ma’s, simply dispense with the chocolate, topping, and garnish, and enjoy plain, buttery, almond-infused cookies, perfect with tea. Cream together in an electric mixer butter, powdered sugar, and cocoa powder. Turn off mixer and add extracts, and 1/2 cup flour, and incorporate into butter mixture on low speed. Gradually add remaining flour on low speed, scraping down sides of bowl as needed. Divide dough into fourths, roll into logs about 1 1/2 inches in diameter, wrap in waxed paper, and chill for 20 minutes or until firm. Preheat oven to 350 degrees. Slice each log into 1/4-inch diagonal slices and place slices 2 inches apart on an ungreased cookie sheet, preferably lined with Silpat or parchment paper. Bake for 8 to 12 minutes (my family likes them a little more “done.”) Remove the cookie sheets to a wire rack and cool completely. Top each cookie with a teaspoon of filling and garnish with a pecan half. In a medium saucepan, mix the soymilk, coconut milk, sugar, extracts, cognac or bourbon, and lemon juice and zest. Whisk the cornstarch together with the water and add to soy milk mixture. Cook, stirring constantly, over medium-high heat until mixture boils and thickens. Cook and stir for one minute after it boils. 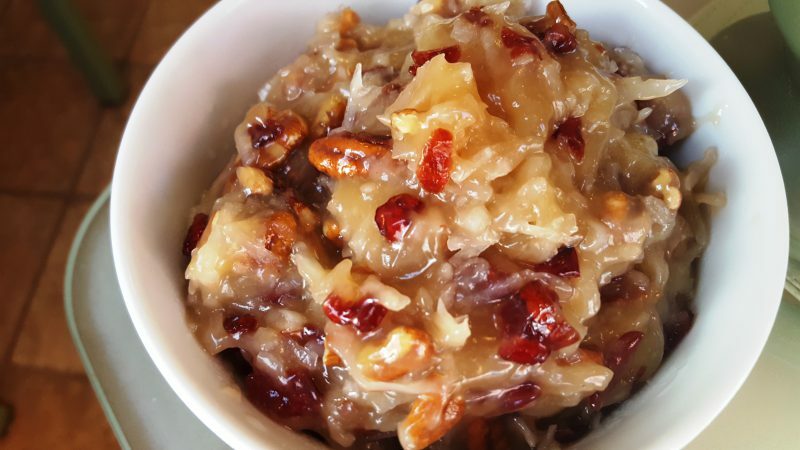 Remove from heat and stir in coconut, pecans and dried cranberries. Cool to almost room temperature before spreading on layers. I regret that I didn’t have time to experiment with this recipe until after Christmas, but it is so exquisitely beautiful and delicious that I can’t wait a whole year to share. Plus, a winter log cake should be appropriate at least through February, no? 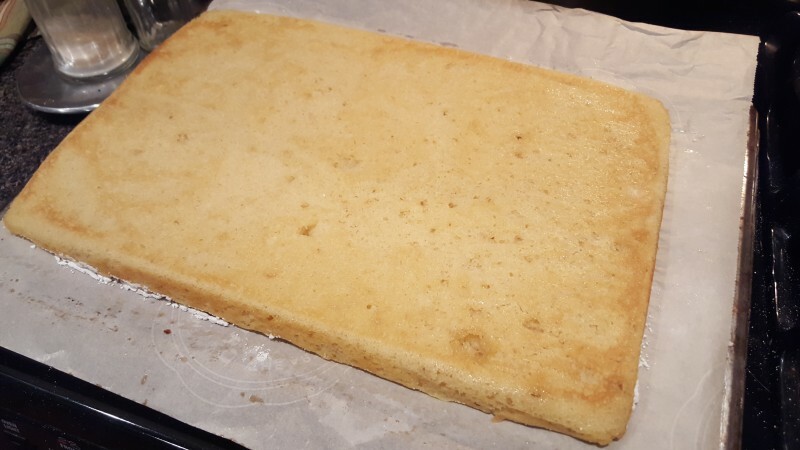 After conducting considerable research online, I chose a recipe for Vegan Swiss Roll on the Allergy Mums website (thank you! ), filling it with my favorite chocolate mousse and frosting it with my longtime favorite mocha buttercream. The creator of the “sponge” claims that it doesn’t crack and, indeed, her photo is picture perfect. However, I found that not to be the case. Still, my accomplice and good friend, Janie Jacobson, a healthy foods cooking instructor and cookbook author, and I were unperturbed because the luscious frosting hid any cracks completely. I have now made two of these cakes–one for an impromptu post-New Year’s tea party and the other for a postponed 12th Night Party on Saturday night. It was a rave both times. But then I made two more rolled cakes according to another recipe and with considerable experimentation on my part in order to perfect the “sponge” to avoid dreaded cracks. In terms of decorating, yes, I know about aquafaba and have made gorgeous meringues, but I was afraid it might not work for the meringue mushrooms typically used to decorate these yule logs. So I devised my own decoration of sliced almonds to suggest shelf-like mushrooms that grow on tree trunks. Some sprigs of rosemary and cinnamon sticks lend a woodsy note–with rosemary being a surprisingly enticing aroma with chocolate–and a light dusting of powdered sugar suggests a hint of snow. Someone told me it was the prettiest Buche de Noel she’d ever seen and another that it was my best dessert creation yet. That makes this recipe good enough to share with you. Preheat oven to 350 degrees. Spray a rimmed 10 x 15″ pan with non-stick spray. Line with one sheet of parchment paper and spray lightly again. Sprinkle a tea towel with a little powdered sugar in a 10 x 15″ rectangle. Set aside. In a small bowl, whisk together soymilk and vinegar, set it aside to curdle for a couple of minutes, and then whisk in flaxseed meal, making a thickened vegan buttermilk. In a large bowl, whisk together flour, sugar, cornstarch, baking powder, xanthan gum, baking soda, and salt. Make a well in the center and pour in canola oil, vanilla extract, and soymilk mixture. Whisk together for 100 strokes until smooth. (Whisking for a portracted time like this will develop gluten and, hence, structure.) Transfer batter into prepared pan and gently smooth into the corners. Bake for 12 to 13 minutes or just until a wooden pick inserted in the center comes out clean. Allow to cool in pan for 3 minutes and then invert onto prepared tea towel. Carefully peel off parchment paper. With a very sharp knife, trim 1/8 inch of cake from all of the edges which tend to be a little dried and may prevent smooth rolling. Working from a long side, fold the excess inch or so of towel over the edge of the cake and carefully roll up like a jelly roll. Tuck edges under and allow cake to cool completely on a wire rack. Carefully unroll, avoiding trying to flatten the cake completely. Gently spread with Vegan Chocolate Mousse. Reroll and place seam side down on a serving platter, nestling it onto a flattened side from the previous rolling. Cut off both ends at a diagonal and position cut pieces to resemble sawed off limbs. Frost with Vegan Mocha Buttercream Frosting. Lightly drag a fork lengthwise down the trunk and cut branches to resemble bark. 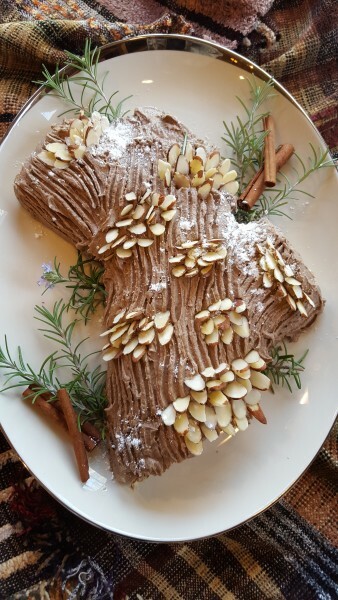 Garnish as desired with sliced almonds, rosemary sprigs, cinnamon sticks, and powdered sugar. Tent with foil and refrigerate until about 30 minutes before serving time. Slice with a sharp or serrated knife. I recommend that you make the mousse 2 hours in advance in case it needs to set up, as tofu varies considerably from brand to brand. Place ofu and sugar into food processor and process until very smooth, scraping down the sides of the bowl with a rubber spatula as needed. Add the melted chocolate, extracts, and a pinch of salt. Process for several minutes until smooth, scraping down the sides of bowl as necessary. Texture should be very thick and creamy. If too thin to hold it’s shape, process with two more ounces of tofu and/or refrigerate, covered, before filling buche. In the bowl of an electric mixer, cream butter with coffee and cocoa powder. Turn mixer off, add 1/3 of confectioner’s sugar and a tablespoon of creamer, and beat until creamy. Repeat with remaining confectioner’s sugar and creamer, ending with last third of sugar scraping down sides of bowl as necessary. Adjust consistency with additional confectioner’s sugar or creamer as desired. Beat in vanilla until incorporated. If a darker color is desired to contrast more with almonds, add more dissolved coffee, cocoa powder, or both. These addicting nuts are perfect for New Year’s Day football watching or any time a protein-packed and exquisite snack is in order. 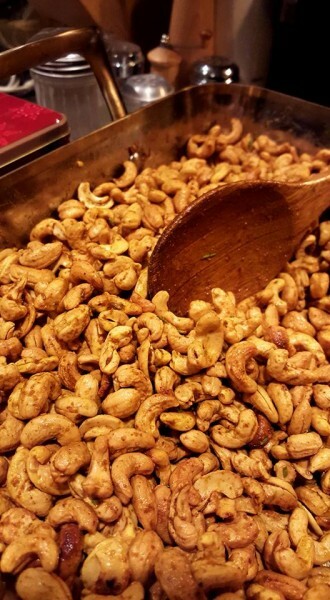 For years Ina Garten’s recipe for Rosemary Cashews was my go-to for snacking and gift-giving. But I found myself craving something with a little more complex flavor and a little less sweet. 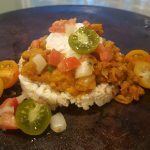 So I began experimenting and this was my favorite delicious result. You may substitute pecan halves if you like, but they will likely require less cooking time. This recipe easily doubles or triples. I triple it and use a large roasting pan. For gift-giving, I like to package the nuts inside a resealable plastic sandwich bag inside a tin to prevent the tin’s interior from becoming messy. Preheat oven to 350 degrees. 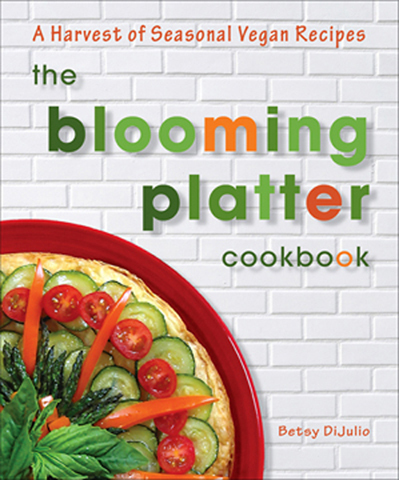 Stir together all ingredients in a 9 x 13″ baking pan, and taste and adjust seasoning if desired. Roast for 20 to 30 minutes, stirring frequently until fragrant and lightly golden brown. Remove to a wire rack to cool completely. Store in airtight containers. 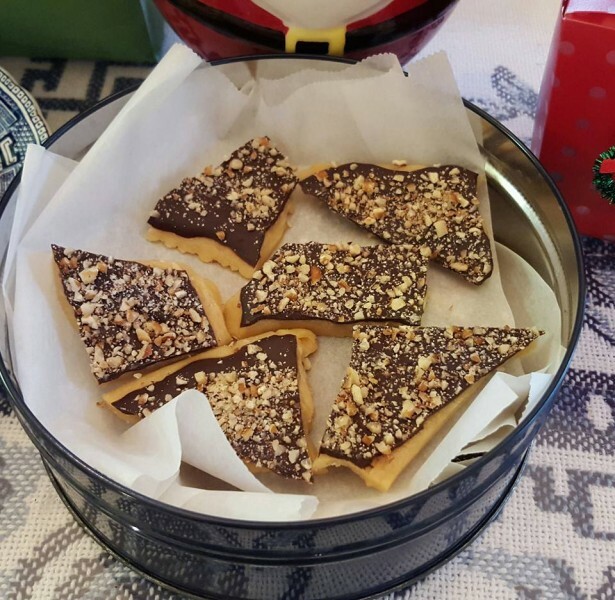 My Mother’s (vegan) English Butter Toffee–THE BEST! My adored late mother (sadly, she passed away on October 2), Sallie Gough, and I made this candy every Christmas, but it is indescribably buttery, silky, and crunchy any time of year…say, for a New Year’s Day party. I made it this year for my annual Christmas, Channukah, Curry & Confections party–where it was a big hit (any leftover crumbles are divine over vegan ice cream)–and made a batch to leave with my father and sister before I left their home in Mississippi and returned to Virginia after Christmas. Butter a cookie sheet with shallow sides and set aside. In a saucepan with a heavy bottom over medium heat, bring butter and sugar to a simmer, stirring frequently. Whisk together water and corn syrup in a small cup and stir into butter and sugar mixture. Attach candy thermometer to side of saucepan without letting the tip touch the bottom, and continue to cook mixture until it turns a golden amber color and registers about 300 degrees on the thermometer. You may have to cook it to 350 degrees to achieve the desired color. Pour immediately onto cookie sheet and spread evenly. Allow to cool completely. Melt chocolate and spread over toffee. 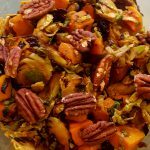 Sprinkle with nuts and store in refrigerator until cold. Break into pieces and return to refrigerator, covered.